I’ve got big plans for this week! 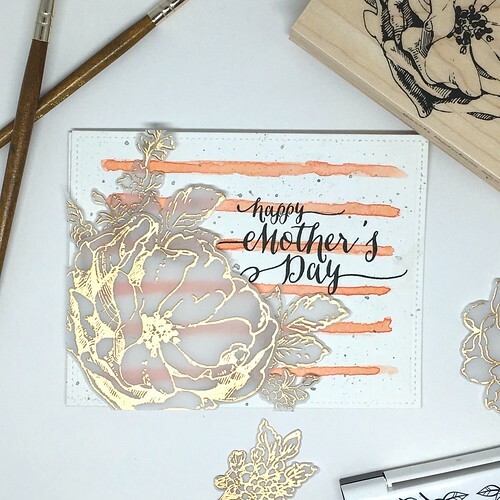 I’m going to share three different posts over the next few days full of Mother’s Day card ideas. First up: two cards I put together using the simple background technique of painting some stripes onto a panel. I used two different paint brushes to add stripes to my panel – one large brush and one much smaller, and you can see that this allowed me to create two different striped patterns on each card. From there, layout and assembly was pretty much the same for each card. 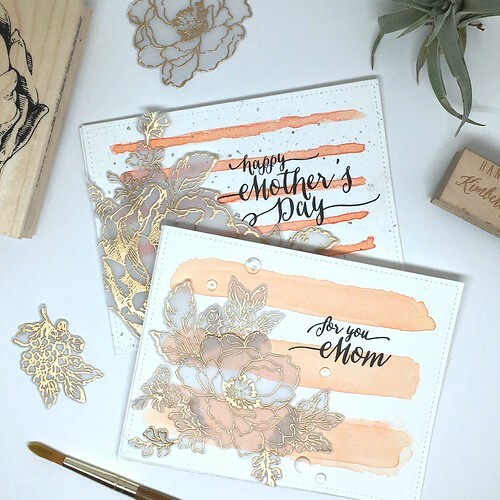 For each card, I stamped and heat embossed several of the outline images from the Altenew Beautiful Day stamp set onto some heavyweight vellum paper using VersaMark ink and gold embossing powder. 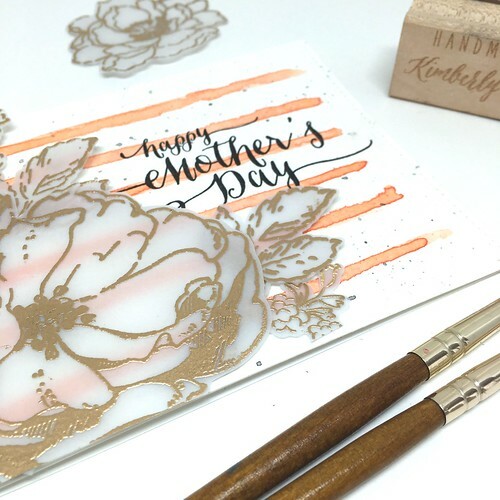 For the skinny-stripes card, I also heat embossed the Antique Rose stamp from Hero Arts with the same gold embossing powder. 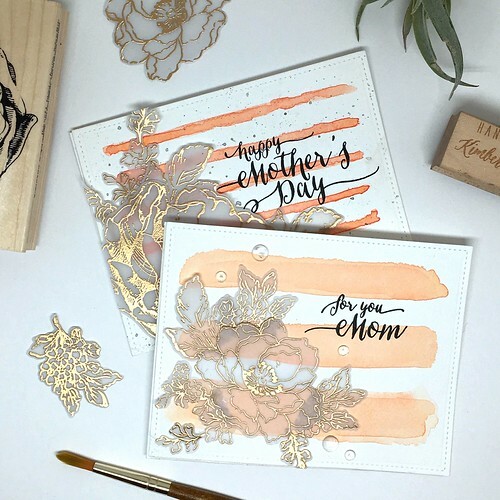 Once I’d finished stamping and embossing the floral images, I arranged them in a cluster at the bottom left of each card. I used foam tape (placed strategically so that you can’t see it through the vellum) to add dimension to the larger central flower, and then used glue dots to adhere the foliage around the central image. I followed the same “rules” for this card, except used a smaller flower from the Beautiful Day set for the focal point. Each sentiment comes from the Wplus9 Strictly Sentiments 4 set, and I stamped each one with VersaFine Onyx Black ink. I used my Mini Misti for this as well. Because watercolor paper can have a bit of texture to it, getting a clean impression the first time can be difficult. So, having a stamp positioner that allows you to stamp in the same exact place more than once, if needed, can come in really handy! I also added a few clear droplets onto the wide-stripe card, just to finish it off. Thinking about it now, I might also go back and add some clear droplets or sequins to the other card, too! Have a great week! 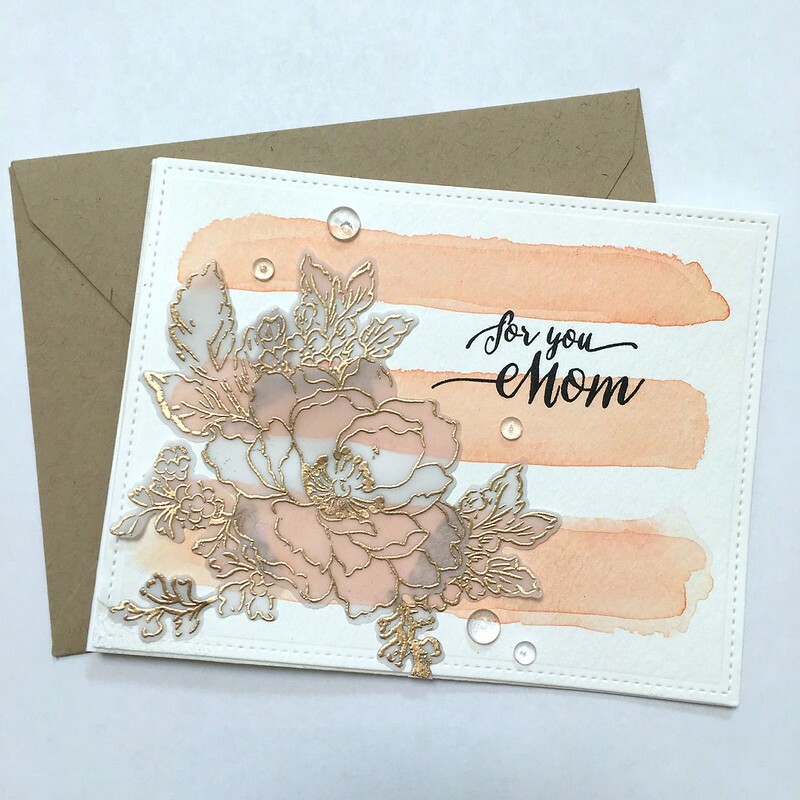 I’ll be back with more Mother’s Day cards on Wednesday!